But that’s exactly what I did this morning when my daughter woke up, found out Halloween was over, and burst into copious tears. “B-b-but Daddy told me Halloween goes on for days!” she wailed. Time means little to a four year old. Elapsed time, even less. Elapsed time during which the child was eating more candy than any adult should in a decade and feeling absolutely fantastic about it? Unintelligible. “Really?” Myra-Jean responded in a quavering voice. MJ started crying again. I should’ve quit when I was ahead. Her cries rose loudly in the small, morning-shadowed room. Jesus. You’d think her dog had just died. She would definitely wake Mike. “Let’s go get some breakfast.” The kitchen was a bit farther from our bedroom. “You don’t say.” Grabbing the utensil gently out of her hand I tossed it into the sink. Just because she was grieving didn’t mean she got to be destructive. I sighed, staring at her uselessly. I was out of ideas. At my feet, Walter mewled. Mina nipped at him. Walter hissed. Myra-Jean screamed. Enter Mike. No big surprise. Hard to imagine how anyone could sleep through an uproar of such Biblical proportions. “What’s going on?” he asked blearily. I had tried this tack already, and knew where it was going. I covered my ears. “I tried this,” I interjected quietly. Wuh-whoa. I’d forgotten about that conversation. “No,” MJ declared. “Mama said I could only eat candy on Halloween, and after that it was only for ‘special occasions’.” She emphasized the latter phrase carefully, although she had no idea what it meant. MIke shot a look at me. “Is this what your parents did?” Mike demanded. Mike shook his head, then smiled. He wasn’t mad. He was just laughing at me. Which is worse. I couldn’t blame him. I turned to MJ. “I’m sorry, honey. Of course you can still eat your candy. For many days to come. Forever.” Or at least a week, I added in my mind. Myra-Jean smiled for the first time that morning. When I left the kitchen she and Mike were happily sorting her booty into piles. There was a lot of it. An indecent amount. 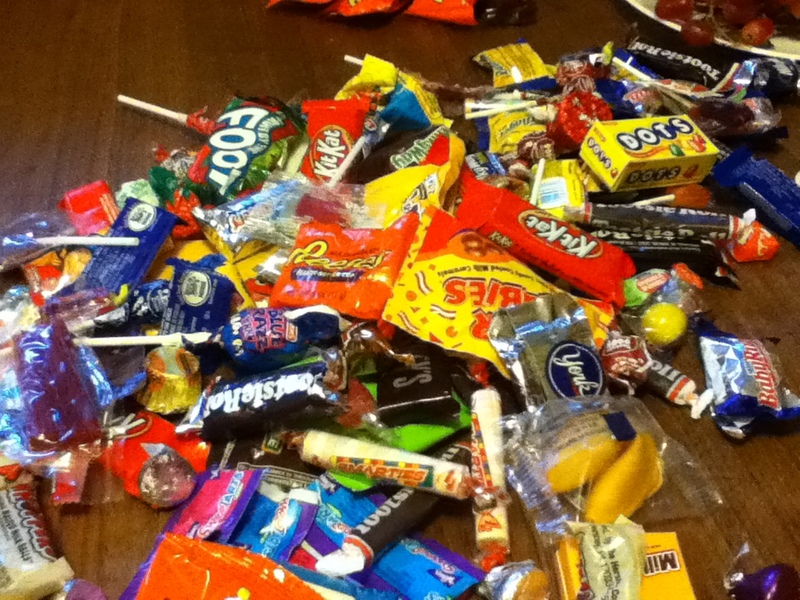 Absolutely no more trick or treating was necessary. Just a little bit more give and take by the old timers. If only you could trick or treat for that. This entry was posted in cat, childcare, dog, household, Outings, Slice of Life's and tagged cats and dogs that fight, dealing with halloween candy, halloween goes on forever, kids and candy, too much halloween on November 2, 2013 by thumbstumbler.